There is no better way to create a cohesive theme in your home than with Mountain Laurel Furniture. All the pieces can be custom ordered just for your home. While tables are a very popular item, we also make headboards for your bedroom and door pulls for cabinets, doors, and closets in your home. Each piece is made in a variety of patterns and shapes, but they all have that unique charm. Are you looking for that perfect look on your home’s wood furniture to match the beautiful mountain scenery on the outside? Or maybe you’re even trying to decide what would go perfectly with your beautiful handrails? Look no further. 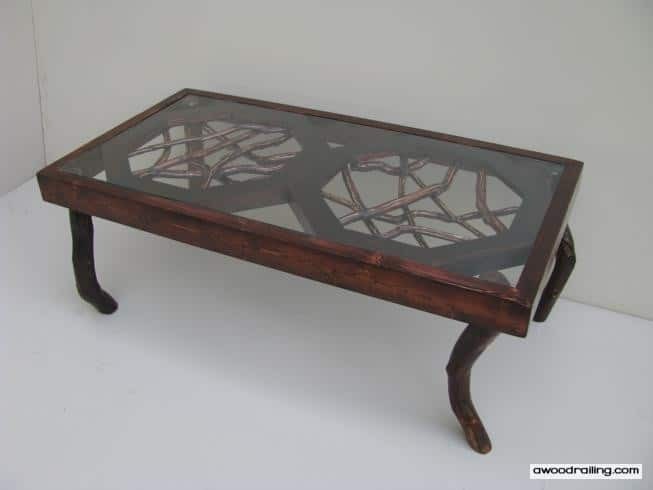 Along with the intricate handrails created here, we also use the sticks for picturesque furniture for any home’s needs, like this coffee table with newspaper racks. It’s important when decorating a home to make sure your furniture matches the feel and theme of the interior design. It would feel awkward to see a metal desk in a cabin. Industrial, modern, plastic, or metal furniture wouldn’t fit in well in your natural or rustic themed home. Instead, take a look at all the creative wooden furniture available here. From a variety of tables to headboards and art, Mountain Laurel Furniture is sure to impress. Now you can have beautiful natural furniture in every room of your home. With the ability to make custom designs, our expert carpenters will make sure that you have the furniture of your dreams to match the home of your dreams. For a log or timber frame home, rustic furniture is a natural complement to the woodwork in the house. This coffee table incorporates light colored sticks to accentuate light colored wood on the inside of any home or to contrast against a darker backdrop. 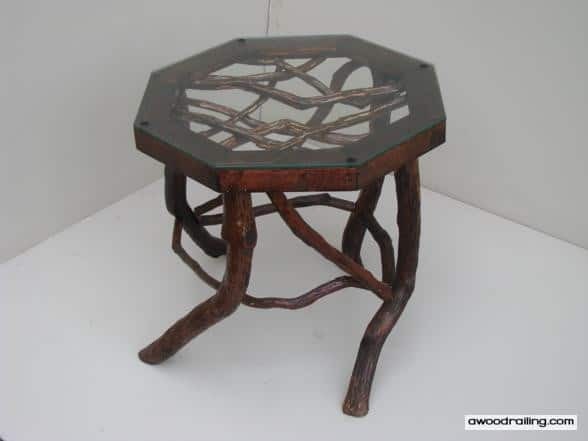 This table also features a double octagon frame design which uses two octagons side by side surrounded by a rectangular frame. 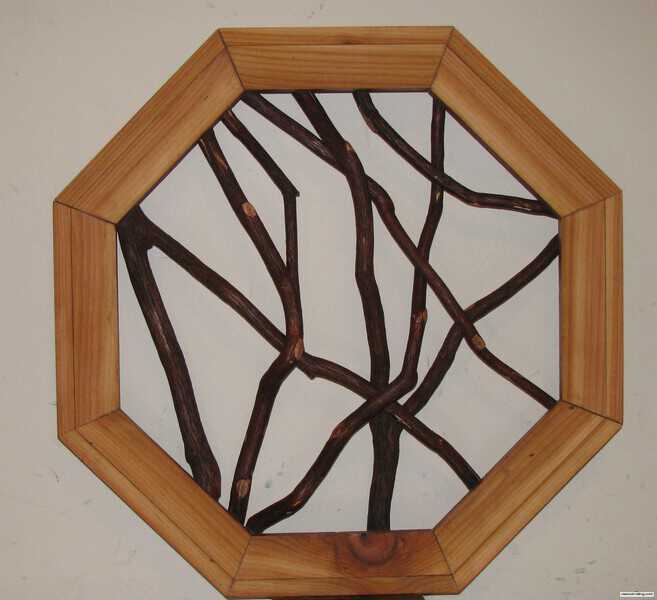 The twigs and branches are woven in the middle of the open space of the octagon shape. These branch coffee tables come in a variety of sizes based on their geometry. 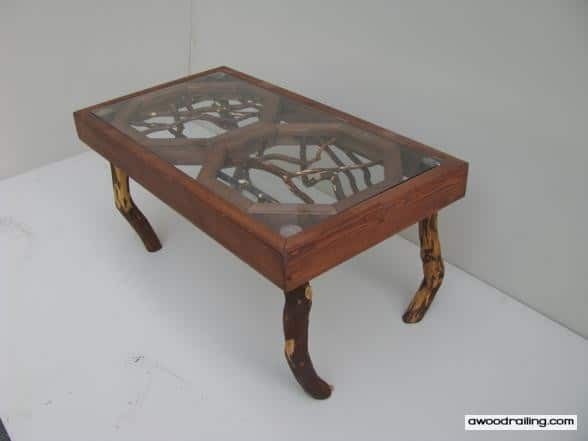 This next coffee table has been stained a darker color and would go perfect with any type of house that has a darker theme, possibly even with a dark colored hardwood floor. This is a great piece of wood furniture for a living room centerpiece. Stain color or paint is an important choice in any home decorating project. Colors are very personal and can be difficult to select, especially when deciding on how to unify many different elements in a room. 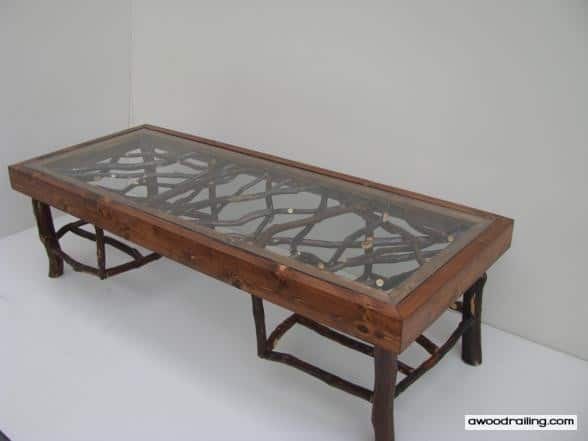 Tables are made with a cedar frame that is joined with woven branches. The legs are larger diameter logs of mountain laurel that are precisely cut to fit. A piece of glass covers the top so that you can enjoy the beauty of an intricate forest in the interior of your home. Depending on your home’s color theme, you can have the lumber and the sticks stained, painted or otherwise finished to suit your fancy. These tables come in all sizes and shapes from small octagonal end tables to large tables with built-in magazine racks. Mountain Laurel Furniture is solid wood furniture, so you can be sure that it is durable and strong. 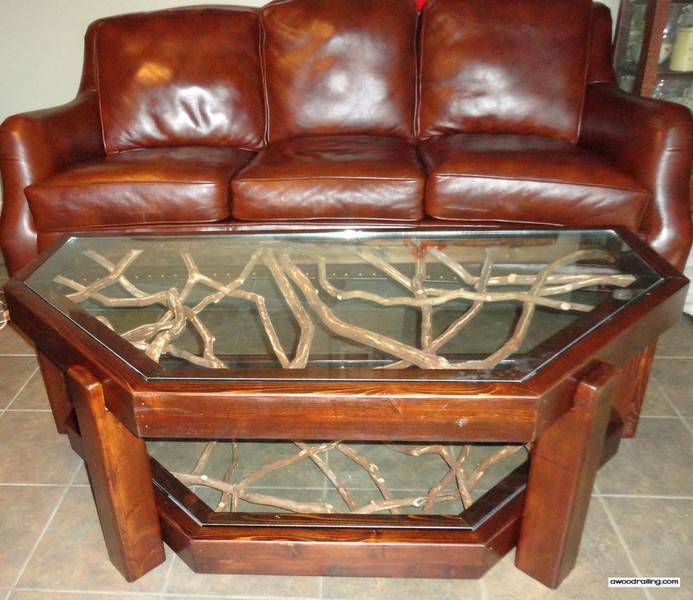 Perhaps you have a custom design in mind for your laurel branch furniture. This is no problem for our skilled carpenters and well-equipped wood shop. Each order is custom-built to match whatever measurements are important to you. The shape of the table you choose can be built to precisely fit the space you have available with some limitations by geometry. Table legs are typically branches approximately three inches diameter. These table legs can be made larger or smaller depending on your preference. Table frames are usually red cedar lumber, but you could choose red oak for oak furniture, pine for pine furniture, or teak for teak furniture. Many more lumber options are available, such as cherry furniture, ipe, knotty alder and hickory. The branches are what gives each table its unique character. Since no two are the same from the forest, no two tables will ever be exactly alike. Sticks can be left with the bark on, which is typical, or the bark can be stripped to the white wood beneath. The sticks and lumber can both be painted or stained for more unique combinations. This custom branch table was built to fit the space! The homeowner wanted a coffee table to go with the leather couch in the picture, but a rectangular table would have stuck out into the walking area. This special trapezoid design allows for free and unrestricted movement around the living room but also has a long edge facing the couch for lots of space. The long edge was measured to fit the homeowner’s precise measurements. Rustic headboards and bedframes are another option for in the home. 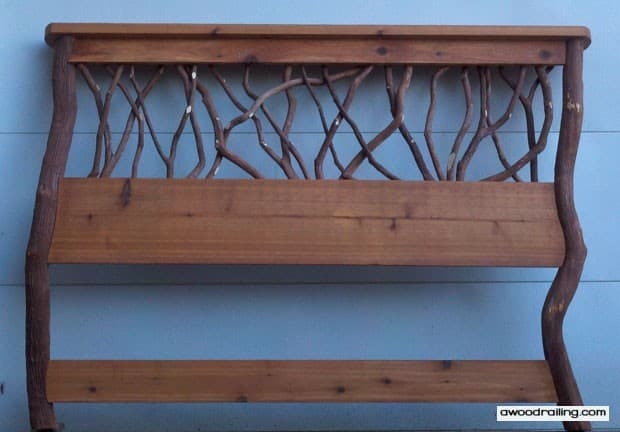 A branch headboard brings the intricate beauty of Mountain Laurel Furniture into the bedroom. This piece is sure to draw attention. Branch headboards, just like every other product, are built to match your unique measurements. This picture shows a typical example of a headboard and can be customized to meet your desires. When decorating a home, every little design element counts. Little things you might not even notice, such as door pulls and drawer pulls, can really make an impact on a space. Don’t choose plastic or metal for your beautiful home when you can have custom wood door pulls instead. They bring a little natural touch to the doors in your home and also work well in every room of the house. 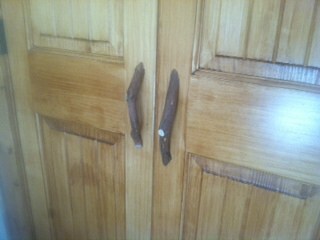 Now, you can match your kitchen cabinet door pulls to your bedroom closets to your front door! These pulls create a sense of cohesion throughout your home, with this classically beautiful design. There are thousands of different furniture creations that are possible when working with mountain laurel and ultimately, the possibilities are only limited by your imagination. The pictures below show more furniture or decorations that our workshop can create for your home. 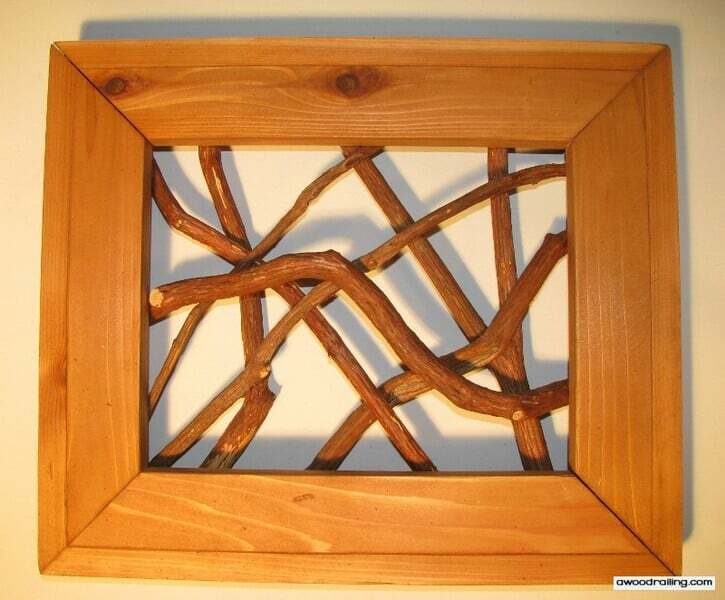 These intricate framed branch art is perfect for any available space on the walls of your home and adds to any home’s appearance. We offer just about any type of rustic furniture that you can imagine. 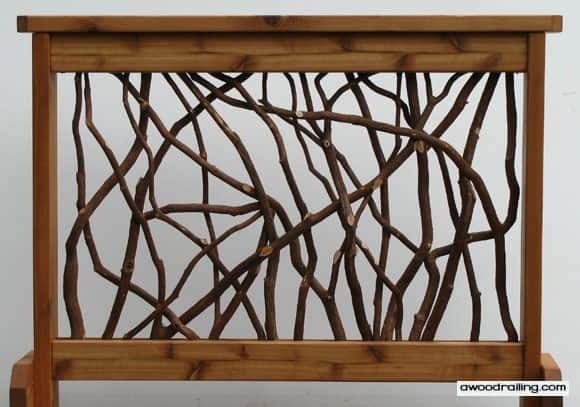 Anything from headboards and tables to framed branch art that can give even the most modern room a touch of mountain beauty.